I have been loving Essie lately. They have come out with some pretty nice collections and I think I bought about 10 of them in the last 2 months alone. This next polish I have debated about getting for a long time. It seemed so different on different people, some I liked and some I didn't like so much. Eventually, I bit the bullet and ordered Essie First Timer and I'm really glad I did! This is a stunning green cream polish and the formula is really nice. Opaque in 2 coats and, although a little patchy, it does even out nicely on the nail. The dry time was ok, a little on the long side, but my trusty SV makes this a non-issue for me. First Timer is part of the 2013 Resort Collection, I already showed you In the Cab-Ana from this collection. I absolutely love how this looks with my skintone. It almost becomes a dusty grass green and it looks really pretty. Just look at these swatches! 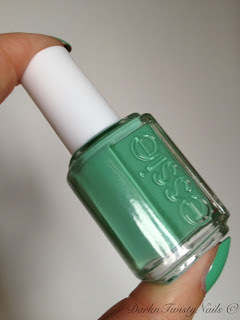 What's your favorite Essie polish? Ja he, heerlijk voor als je de zomer nog net niet los wilt laten! Such a vibrant green. I'm with ya on the brushes...I think the smaller brush gives you more control. That's exactly why I like them better. I really hate the brushes that paint your nail and cuticle at ones. Mijn favoriete essie lakje is een donkerrode(bordeaux), ben ff de naam kwijt. Oooh! What a pretty green! Reminds me a lot of Zoya's Josie. Love it! It's so much better than i thought it would be! I was a bit afraid that it would look like Navigate Her, hahah! Oh boy, don't get me started on Navigate... still don't know if I like of hate it, ha ha ha!